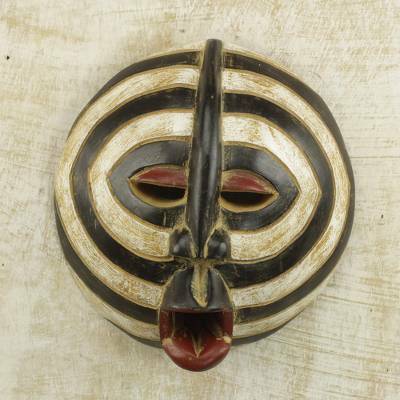 African Sese Wood Mask with Beige and Black Rings from Ghana, "Baluba Rings"
Carved by hand of sese wood in the traditional style of Baluba tribe masks, this African mask makes a striking addition to any home. The Baluba people of Africa, known for their farming lifestyle, are native to Zambia and Zaire. Ghanaian artisan Abdulai Osman Adam crafts the mask to feature alternating rings of black and white, with a rustic finish and a prominent nose bridge that extends up and down the face. You can find african wood mask 'Baluba Rings' by Abdulai Osman Adam in masks categories such as Ghanaian Masks and Wood Masks. Enjoy exploring these sections for other Novica treasures. Abdulai Osman Adam has received 5 microcredit loans with 0% interest from Kiva and Novica, the first for $300 and the most recent for $600. This mask is small in size; however, it is both dramatic and impactful to any decor. The color contrast between tyhe beige and black accentuates the physical features of the face. It is a beautiful piece!